Train in color with the Focus for Women sport earphones from yurbuds®, designed specifically to fit smaller ears. Featuring our TwistLock™ technology and a FlexSoft™ comfort fit, these yurbuds are guaranteed never to hurt or fall out. Their ergonomic design is sweat and water-resistant and allows ambient noise, permitting you to remain aware of your surroundings. 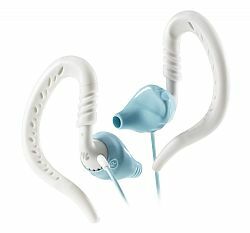 Enjoy consistent, premium sound quality and added comfort and support offered by the soft, moldable ear loops. yurbuds Focus for Women are the perfect training partner for any female athlete. yurbuds TwistLock into place for a secure fit that never falls out, even under the most intense workout conditions. Designed to allow more ambient noise than most other earphones at the same volume levels. Ergonomically designed to avoid nerve rich areas of the ear. Made with flexible silicone, yurbuds are ultra soft and comfortable for hours on end. Deliver consistent music, which is clinically proven to inspire longer, harder workouts.